These funds lost a lot of money for shareholders this year. Millions of investors use exchange-traded funds to make money on profitable trends, but some ETFs performed disastrously in 2016. The funds listed below as the worst ETFs of 2016 were all among the bottom 25 in terms of year-to-date performance, according to Morningstar, and they represent three major adverse trends that hurt investors during the year. Let's go over what those trends were and how they hurt these poor-performing ETFs in 2016. After several years with no major market downturns, many investors have looked to volatility ETFs as a way to bet on a future crash. Yet even though there were some periods of volatility in the stock market during 2016, the continuation of the bull market into an eighth year caused big losses for those who were counting on the long-awaited bear to come out of hibernation. Some leveraged volatility plays lost 90% or more of their value during the year, and even the unleveraged iPath S&P 500 VIX ST Futures ETN fell by two-thirds in 2016. Among volatility plays, the inverse VelocityShares Daily Inverse VIX ST ETN (NYSEMKT: XIV) was a rare winner, climbing by 78% and taking advantage of the favorable conditions that caused most regular volatility ETF investors to suffer such massive losses. The year's events once again showed that for the most part, volatility ETFs are best suited for short-term calls, rather than buy-and-hold investments. Gold didn't perform well in 2015, and some investors thought the specter of rising interest rates and continued strength in the U.S. dollar would combine to make 2016 another bad year for precious metals. However, gold rebounded early in the year, and even though it has given back some of its gains, most mining stocks have held on to big advances for the year. That's bad news for the inverse Direxion Daily Junior Gold Miners Bear 3x ETF, which is leveraged and found itself on the wrong side of the trade this year. Mining stocks in general performed well during 2016, but the smaller companies that this ETF targets were particularly big winners this year. With the most to lose from falling gold prices in past years, these junior mining stocks amped up returns during more favorable conditions in 2016. Gold is starting to lose steam toward the end of the year, so 2017 almost certainly has to be a better year for investors in the Direxion bearish gold ETF. Finally, the results of the U.S. presidential election had big implications for domestic energy policy, and traders quickly responded to the election results. While fossil-fuel energy companies have climbed substantially since early November, renewable energy companies have taken big hits. Among green ETFs, the iPath Global Carbon ETN seeks to track the prices of carbon credits, which are traded on free markets in some countries with regulatory frameworks governing pollution emitters. Even before the U.S. election, the decision of the U.K. to leave the European Union had created uncertainty for European carbon-credit trading. Moreover, reluctance among countries like Australia to come up with carbon-trading frameworks of their own in the near term has weighed on sentiment. The iPath ETN doesn't have very much trading activity, but ETFs focusing on solar and other renewable energy production have seen similar pullbacks as investors prepare for energy policy changes in 2017. 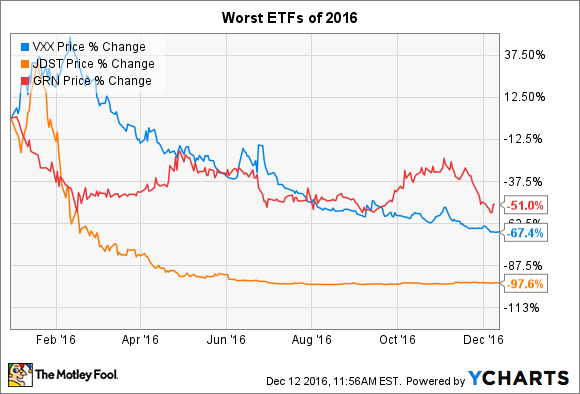 These ETFs weren't the only ones that lost ground during 2016, but they show many of the trends that hurt ETF investors during the period. Although a bounce is possible for some of these funds, investors should be cautious before assuming that mean reversion will guarantee more favorable returns in 2017.